We will be focusing only on children that can compete in the Connacht Indoor Track & Field that takes place in February. NO younger children/siblings will be allowed to take part in these sessions as we do not have enough coaches and the younger age groups are not eligible for the upcoming indoor competition. 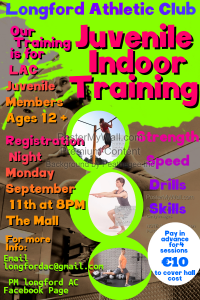 Starting Monday September 11th we are going to have a weekly indoor strength and conditioning session with sprint drills in the gymnasium at The Mall only for juveniles that are in secondary school (MUST be age 12+ years old). Every Monday, 8-9pm, cost €10 for 4 weeks. We are only collecting the money once a month so you have to pay the full €10 on that night in order to take part for the first 4 sessions. Outdoor training at The Mall resumes on Friday September 8th and will be every Friday evening 7-8pm running on the grass and paths. 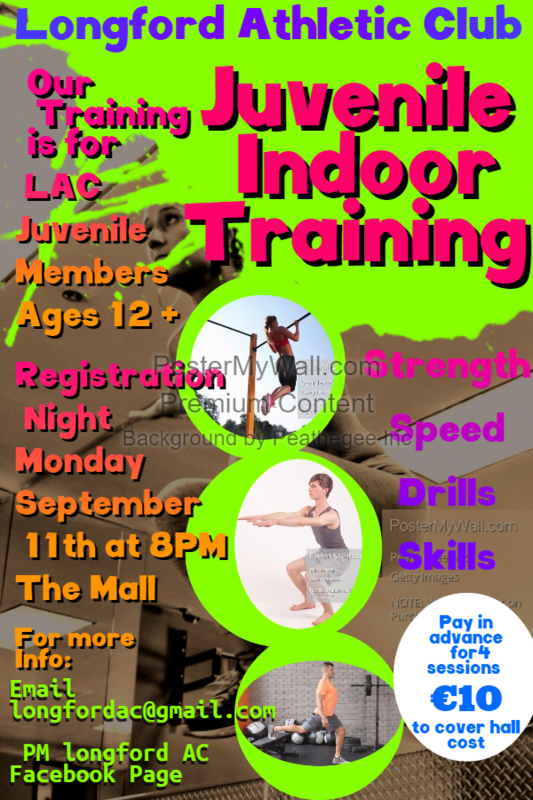 We plan to book sessions on the indoor track at AIT for once per month. Attending both nights is highly recommended to build up fitness over the Fall\Winter to be ready for Indoor competition in February. It takes months to get in top form not afew weeks! Each of you can have an idea what events you want to work for and bring all your questions about what you need to be doing in training to the first session on Monday September 11th and we can work on training plans for sprinters, 200m, middle distance, cross country. Training is scheduled once a month at the AIT Indoor Arena to give all our juvenile athletes the opportunity to gain experience on the track and become familiar with starting blocks, relay teams and field events (high jump, long jump and shot putt) so they are prepared for upcoming competitions. Extra help is always needed on the night and all parents are most welcome to lend a hand. Age categories are calculated from 31st December in the year of competition. No athlete may obtain a birthday in the year of competition and compete in that age and athletes are confined to their own age group only. When entering any field event athletes must be technically proficient and competent in that event in the interest of safety. Relay Teams: an athlete may move up one age group as long as at least 2 members of the competing relay team participating in the event on that day must be of the correct age. For 17, 18, 19 age groups all athletes may move up one age group in relays.